I think I figured out the key for me - I need to focus on me for a bit. Not be self-centered, but truly take care of myself. 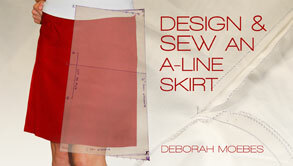 So, I'm still working on my skirt for the A-line class from Craftsy. I finally took all my measurements and started drafting the pattern. I have to go back and re-watch that part, but it's coming along. It's a good first draft. It was a hard weekend for me, and honestly, I didn't get a whole lot of crafting done. But, I got some rest, re-focused a bit, and I think I can finally get back on track for a lot of things. One step at a time, it's coming together. It's not easy, and it's not fast, but there's progress. And that's what crafting is really all about isn't it? Progress. Keep making progress, and moving forward, and all will be well.